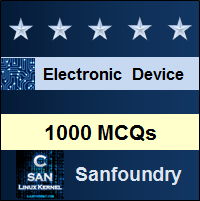 Our 1000+ Electronic Devices and Circuits questions and answers focuses on all areas of Electronic Devices and Circuits subject covering 100+ topics in Electronic Devices and Circuits. These topics are chosen from a collection of most authoritative and best reference books on Electronic Devices and Circuits. One should spend 1 hour daily for 2-3 months to learn and assimilate Electronic Devices and Circuits comprehensively. This way of systematic learning will prepare anyone easily towards Electronic Devices and Circuits interviews, online tests, examinations and certifications. Who should Practice these Electronic Devices and Circuits Questions? The section contains questions and answers on basics of electronic devices and circuits, methods, frequency responses, time signals, network theorems, analysis of circuits, modulation, transmission and coupled circuits. The section contains questions and answers on semiconductor electrons, holes and conductivity, donor and acceptor impurities, fermi level semiconductor, charge densities, diffusion, carrier lifetime, continuity equation and hall effect. The section contains questions on pn junction qualitative theory, p-n junction diode, band structure of open circuited p-n junction, components in p-n junction diode, volt ampere characteristics, diode resistance and capacitances, pn diode switching times, breakdown and tunnel diodes, point contact diode, p-i-n diode and its characteristics. The section contains questions on basics of diode, types of diodes which includes zener diode and others, limiting and clamping circuits, rectifiers and characteristics of junction diode and diode forward characteristic modelling. The section contains questions and answers on half-wave and full-wave rectifier, bridge and voltmeter rectifier, inductor and capacitor filters, l-section filters, clc filters and voltage regulation. The section contains questions on transistor amplifier, transistor construction, junction transistor, common base, emitter and collector configuration, ce and cb characteristics, dc load lines, transistor switch and switching times. The section contains questions and answers on operating point, bias stability, collector-to-base and collector-emitter bias, self bias, bias compensation, thermistor, thermal runway and stability. The section contains questions and answers on basics of signals, amplifiers, sinusoidal steady state analysis, amplifier circuit models and frequency response. The section contains questions and answers on ideal operational amplifiers, inverting and non-inverting configuration, differentiators and differential amplifiers, operational amplifiers, finite open loop gain effect, circuit performance bandwidth and large signal operations. The section contains questions and answers on basics of MOSFET, device structure, physical and small signal operation of MOSFET, basics of MOSFET configurations and circuit biasing, body effect and discrete MOSFET circuits. The section contains questions on basics of BJT, device structures and physical operations, circuits, current-voltage properties, amplifier design, signal operations and circuit configuration and biasing. The section contains questions on ac models and analysis, transistor amplifier, biasing parameters, two port devices and hybrid model, transistor hybrid model, h-parameters and its measurement, cb transistor physical model, hybrid model in ce, cb and cc, ac and dc analysis problems, transistor circuit analysis and millers theorem. The section contains questions and answers on junction field effect transistor, pinch off voltage, insulated gate, fet small signal model, common source and drain amplifier, fet biasing, fet amplifier and unijunction transistors. The section contains questions on class a large signal amplifiers, second and higher order harmonic distortion. The section contains questions and answers on cascading amplifiers, decibel, cc and cb configurations, ce amplifier, emitter follower, high input resistance transistor circuit, cascode transistor and amplifiers. The section contains questions on high frequency t model, hybrid pi models, alpha cutoff frequency, ce short circuit current frequency response, resistive load and transistor amplifier response. The section contains questions on low and high frequency responses on cs and ce amplifiers, high frequency models of bjt and mosfet, millers theorem, high frequency response of source and emitter followers, differential amplifiers, mos and bipolar cascode amplifiers, cd-cs, cc-ce, cd-ce, cc-cb and cd-cg configurations, pole splitting, frequency and miller compensation. The section contains questions and answers on input bias, voltage, current, multistage and differential amplifiers, feedback structure and negative feedback properties, transconductance and transresistance amplifiers, a, b and ab output stages, feedback effects, power bjts, heat sinks and variations in ab classification. The section contains questions on oscillators, class b and d amplifiers. If you would like to learn Electronic Devices and Circuits thoroughly, you should attempt to work on the complete set of questions and answers mentioned above. It will immensely help anyone trying to crack an exam or an interview. Here’s the list of Best Reference Books in Electronic Devices and Circuits. Wish you the best in your endeavor to learn and master Electronic Devices and Circuits!